Welcome to the Alexa Skills Kit technical documentation. The technical documentation contains overviews, API reference, and focused code examples. This page provides the latest guidance to help you get the most out of the documentation. In the documentation, look for short, focused code examples that demonstrate features using the Alexa Skills Kit SDKs. The code examples focus on specific features that you can incorporate into your own code with minimal modification. The following is a code example from Control Interruption of Alexa's Speech. If you can't find a code example for the feature that you want to add to your skill, please let us know using the feedback button. When the documentation provides an example of a user utterance, you can often find a language tab for each supported language. 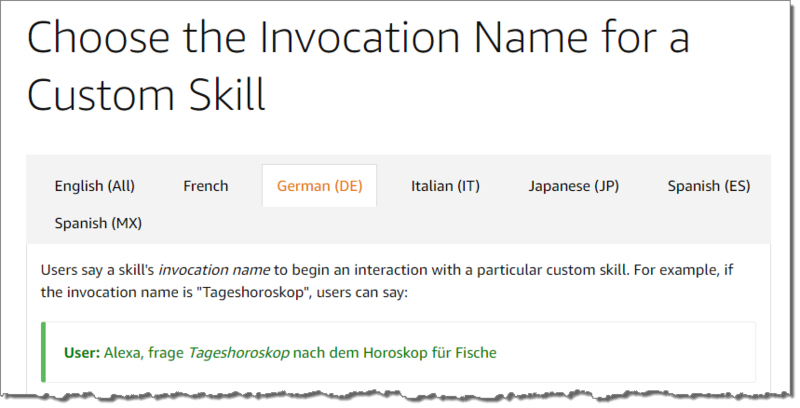 The following is an example from Choose the Invocation Name for a Custom Skill. The quick reference pages provide consolidated lists of various resources – concepts, procedures, API reference, sample code, blog posts, videos, podcasts, webinars, Twitch streams – related to a specific topic, such as selling products in your skill. You can help us improve our documentation! Provide feedback by using the feedback button that appears on every page. 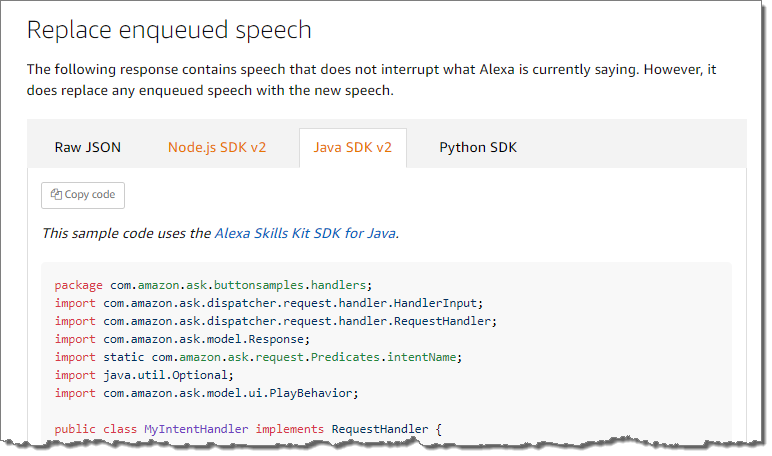 You can find links to the technical documentation for the latest Alexa Skills Kit features at Release Update. 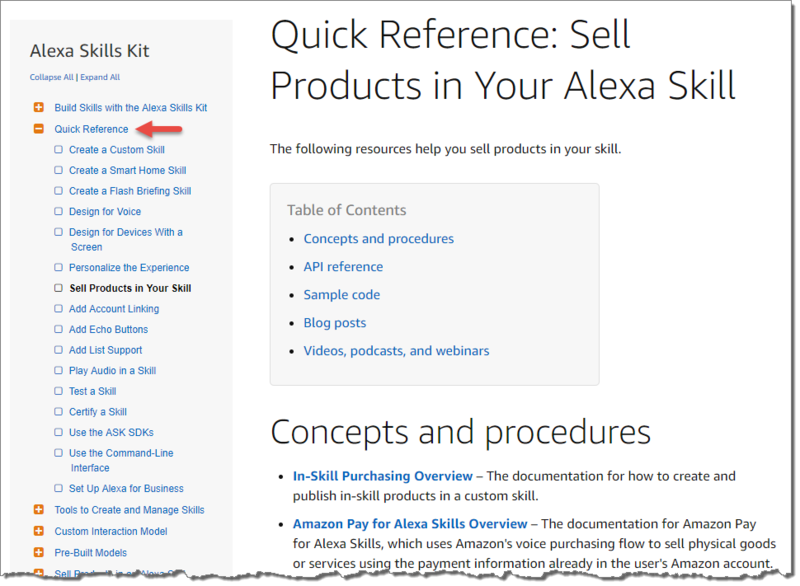 The technical documentation focuses on the nuts and bolts of the Alexa Skills Kit, particularly API reference. The following additional Alexa Skills Kit resources are available to you, outside of the documentation. Alexa blog – Feature announcements and tutorials. Alexa Design Guide – Best practices for building Alexa-enabled experiences. Alexa GitHub repository – Tutorials and end-to-end samples that you can download. Many of the tutorials are within the repository of the corresponding Alexa Skills Kit SDK. Alexa Twitch channel – Live streams about building skills for Alexa. Alexa Developers YouTube channel – Videos about building skills for Alexa.